In this example, you will learn the simple logic behind C program to compare two numbers without using relational operators and its implementation in C program. Don’t get amazed, there is a simple mathematical logic behind it which I will explain step by step. How to find greater number among two without using relational operator in C? By performing above calculation we will get a number that is twice the bigger one. Now divide the number by 2 to get the original number. Here is the implementation of above process in the program. How to find smaller number among two without using relational operator in C? By performing above calculation we will get a number that is twice the smaller one. Now let’s see how it is implemented in the program. In both programs, we have used math.h header file for using standard abs( ) math library function. 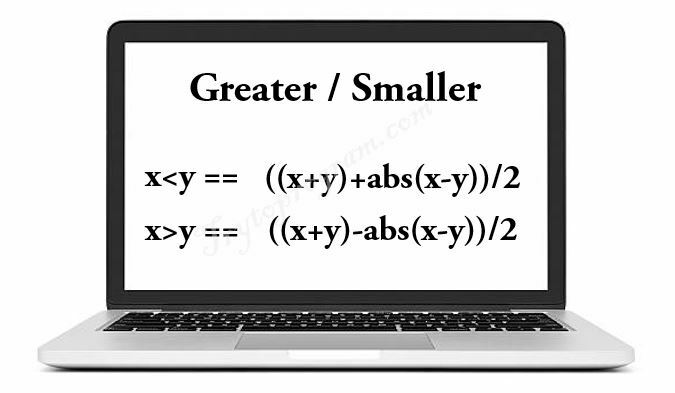 This function is used for using absolute value i.e. positive values only.